Hey Recofloor! We’ve doubled the amount of recycled waste vinyl flooring. For those who are familiar with our website and our ways of working will know that we have talked about Recofloor and its Take back scheme on several occasions. One example is in March, where managing director Steve Dixon and contract manager Mark Power were invited to Recofloor’s 2016 awards ceremony hosted by Matt le Tissier at the Old Trafford, where S&D Flooring was awarded Bronze and Best Newcomer of 2016. Nevertheless, half way through the year, we are pleased to announce that S&D Flooring has doubled the amount of waste vinyl we have recycled last year and exceeded this year’s targets of recycling 5 tonnes – now that is an achievement to be proud of! Between January and July 2016, we have recycled a total of 5.92 tonnes of waste vinyl-based flooring products – 0.75 tonnes of which was recycled in July alone. Fortunately on Wednesday 20th July the S&D Flooring team was thrilled to take part in a Photoshoot opportunity on behalf of Recofloor to demonstrate the successes and benefits of using the Recofloor scheme. Despite the extremely hot weather, Managing Director, Steve Dixon was thrilled to show and demonstrate the company’s efforts to reducing our environmental impact and how we integrate Recofloor into our day-to-day activities. Who are Recofloor and why we work with them? 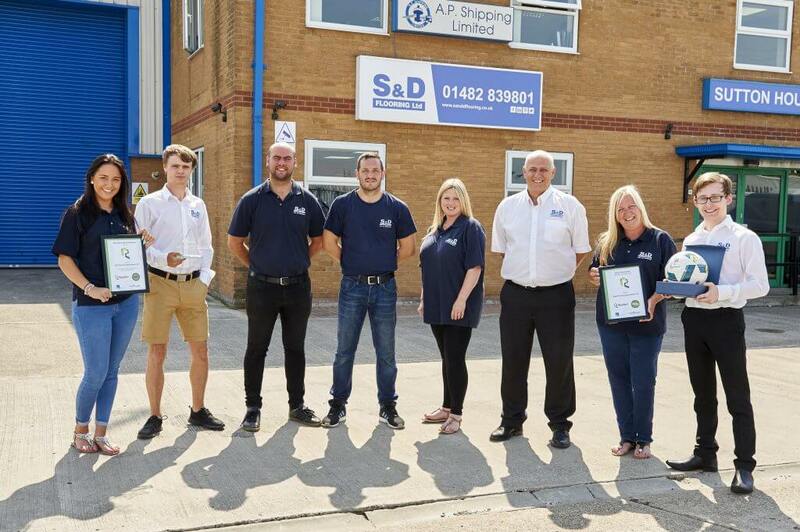 S&D Flooring aim to become one of the greenest flooring contractors in East Yorkshire by ensuring that we constantly recycle our waste vinyl based products. – Uplifted and clean loose lay. The vinyl based flooring off-cuts and uplifted vinyl is placed in clearly labelled bulk bags that can be dropped off at any participating flooring distributors – over 60 are currently located in the UK and Ireland – or for a small fee, Recofloor itself can collect your waste vinyl when you have two or more bags full. The Recofloor Take Back scheme offers construction companies the opportunity to reduce the cost of waste. It is far more economical for organisations to take advantage of the Recofloor scheme as the cost of sending your waste vinyl to recycling plants is significantly cheaper than disposing of waste at your local landfill site. Not to mention it is far more sustainable and environmentally friendly! Whereas, smooth and safety vinyl flooring off-cuts are recycled into new flooring products by Altro and Polyflor, whereas smooth uplifted flooring is reprocessed into traffic management products, such as cones and sign bases.